Search here to find child care in your area. 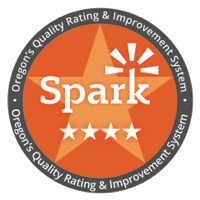 Please note that this is not a comprehensive list of programs in your area: It reflects only programs that applied for a Commitment to Quality designation or a star rating in Oregon's Spark. Though Spark is intended to be a measure of quality, inclusion on this list does not necessarily constitute endorsement from the Center on Early Learning, The Research Institute, or Western Oregon University. This program is committed to improving its quality. This program may qualify for a higher rating but is either in the process of applying or has not yet applied for one. This program meets essential standards that support quality learning for all children. This program exceeds essential standards that support quality learning for all children. This program excels in essential standards that support quality learning for all children. 211 helps you find local community resources or child care providers. Educational Service Districts provide evaluations and screens for developmental disabilities. FACTOregon provides information and resources to empower families experiencing disability birth-young adult. Find Child Care Oregon is a online resource that can help you find child care in your area. Head Start is a free preschool funded through the Federal and State governments. Just in Time Parenting (Oregon State University Extension Service Free Newsletter) Prenatal through 6 years. The newsletter provides information on typical child development in an easy to read format. Oregon Department of Education Early Learning Division Information on free child care, preschool, and home visiting opportunities for families with children from Birth to 5 years. Oregon Department of Human Services This website provides information on how to access programs for children and families, such as food assistance, child care assistance, and children with disabilities. The Ages and Stages Questionnaire (ASQ) is a free online developmental screening tool, designed for parents of children birth through 6 years, to check their child's general development. The Family Conservancy provides parenting resources and information on a variety of subjects for families with children birth through school age. VROOM is an app that provides evidence based fun and engaging activities for parents and caregivers to encourage learning and development in their children, birth to 6 years. Zero to Three parenting resources are designed to support parents during the first three years of their children's lives. They believe that parents are the experts on their children and encourage them to be actively engaged in their learning and development.